Alicia Amerson is a marine biologist, FAA UAS drone pilot and instructor, and a marine conservation & policy consultant. 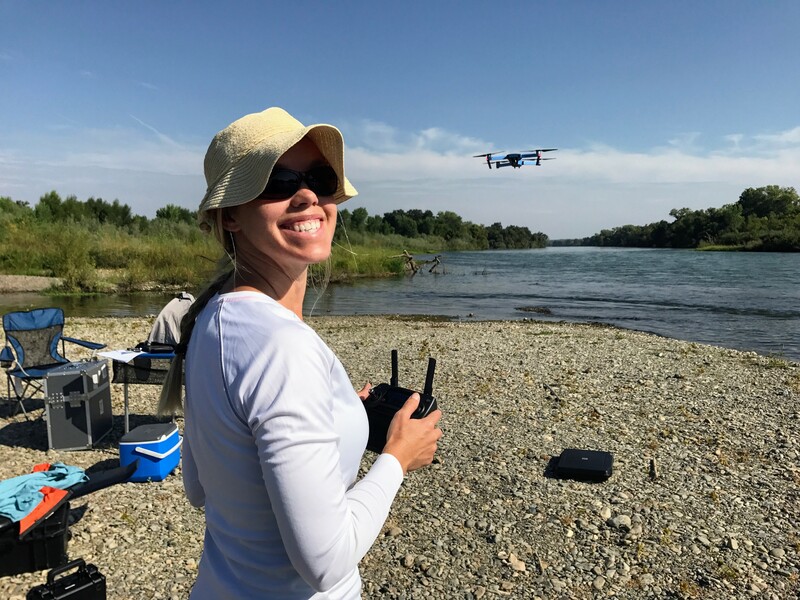 She created the first Marine Wildlife UAS Task Force in California to address responsible flying around near wildlife that use coastlines and ocean habitats. In 2016 she was the first California Sea Grant State Fellow to be placed in the Office of the Lieutenant Governor of the State of California. She is a large whale disentanglement volunteer in California and secured $100,000K of state funds for the volunteer teams as a Sea Grant Fellow. She continues to work closely with government and NGOs on developing UAS guidelines that will align with current and future regulations. While we wait for regulatory guidance she is focused on delivering general awareness to reduce impacts to marine wildlife. As a marine biologist, drone pilot, and instructor, I see how drones give us a new perspective on wildlife. It is our duty to use the new technology respectfully and with diligence. When I launched AliMoSphere in the beginning of 2017, it was with the primary goal of developing America’s first set of Unmanned Aircraft Systems guidelines that are focused on protecting marine wildlife from irresponsible drone use. I got the idea to use drones for conservation and to protect wildlife when I worked for two field seasons researching whale body condition with Dr. Fredrik Christiansen at Murdoch University in Perth, Western Australia. My mission at the outset in launching AliMoSphere was to create the first set of comprehensive guidelines that provide protection for wildlife and encourage drone pilots to consciously think about their flight operations prior to taking off. In my own research, I use drones to collect photogrammetry data to measure the body condition of large whales in reproduction areas, specifically mothers and calves. Mothers do not forage for months while nursing and raising their newborn calves in the reproduction areas. This research was recently approved for publication in the Marine Ecology Progress Series. Prior to working in Australia, I had finished my thesis at Scripps, where I observed over forty whale-watching operators in Canada, the United States, and Mexico to see how they implement tourism operational guidelines and regulations. I saw how the two ideas could be merged, because there were no guidelines for flying drones over whales or other wildlife species. Significantly increasing numbers of drones were being flown over the California coast. I saw this as an opportunity and proceeded to create guidelines to reduce wildlife disturbance, based on my research, scientific disturbance evidence, and the implementation of risk-mitigation factors used by researchers who have approved permits. Drones are changing the way we conserve, protect, monitor, and research wildlife. The most valuable use for a drone is to protect the most endangered species, such as elephants, rhi-nos, and big cats, from poachers and big game hunters who set lures outside of sanctuaries. To protect our ocean resources, drones need to be properly regulated so that fishermen do not use drone swarms to assist fishing vessels in further depleting over-fished stocks, such as blue fin tuna, or to increase efforts to harvest sharks for the shark fin trade. Anthropogenic impacts, such as marine debris, whale-watching, hiking, kayaking, camping, and photography, are adding up along our coastlines. If humans don’t manage these cumu-lative impacts, soon we may not have wildlife to enjoy. Drone technology is emerging faster than regulations, so it only takes a few bad flyers to impede our ability to use drones for their intended purposes as research tools and for social innovation. The debate about drone use will continue, since it impacts airspace restrictions, privacy, licensing requirements, and other issues. In putting together comprehensive recommendations, I wanted to ensure that the guidelines we follow when flying drones are respectfully implemented to reduce disturbance to wildlife, while promoting the use of drones for research. With the help of a task force made up of state, national, and international advisers, the comprehensive set of guidelines detailing responsible flight practices in marine habitats was released in October 2017.